Will Superman Ever Escape The Donnerverse? My confidence in Zack Snyder’s forthcoming reboot of Superman took something of a tumble a few weeks back when I saw the woeful Sucker Punch, a plotless mess that seemingly merged a rejected concept for an Evanescence music video and the masturbatory fantasies of a teenage video-game fanatic. Yet, the rising fears were ultimately calmed by the knowledge that Snyder – who is clearly dependent on strong source material – would be supported by Christopher Nolan and the screenwriter David Goyer who, via Batman Begins, obviously know a thing or two about successfully rebooting a moribund superhero franchise. The news, however, that actor Michael Shannon (Revolutionary Road, Boardwalk Empire) has been cast as Kryptonian villain General Zod in Man of Steel – note the confirmed title – has prompted a heavy sigh. It’s not so much the choice of actor – he’ll work well, I think – but more the fact that, yet again, the cinematic Superman just cannot escape the immense gravity pull of the Richard Donner Superman movies. I can certainly understand the impulse: the flagstone of modern comic book cinema, Superman: The Movie (1978) casts a very long shadow indeed. It’s not a perfect film, but it got the make-or-break areas – casting, tone, respect for the source material, the achievement of spectacle – abundantly right and is utterly deserving of its hugely iconic reputation. The 1980 sequel, impressively coherent given the extremely fractious nature ot its production – Donner was fired having shot 70% of the film, his replacement Richard Lester re-shot Donner’s footage to gain sole directorial credit – remains lauded for its breathtaking action sequences and Terence Stamp’s vivid and aristocratic portrayal of the pathologically-arrogant General Zod. It speaks volumes, of course, that Donner’s films – film-and-a-half if we’re being pedantic – have excercised such a potent influence on the screen Superman in the three decades since their release. 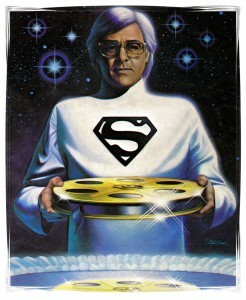 The soon-to-end Smallville TV series has showcased numerous explicit homages to Donner’s films and where Zod himself has been a recurring presence for years. Far more pointedly, Bryan Singer’s 2006 Superman Returns posited itself, rather boldy if ultimately to its heavy detriment, as a de facto sequel to Superman II. There’s no doubting that such connections to Donner’s illustrious duo provide a great frisson in the fan community – myself absolutely included – and but the news of Zod’s presence in Snyder’s film is fostering a very heavy impression that there’s now an outright dependence on Donner’s films to ratify any current film incarnation. Certainly, I can see the fulsome attraction of Zod: the General is more than a match for Superman and, of course, he provides a narrative link to Superman’s origins on the planet Krypton. Yet, this has all been done – and done iconically well. Isn’t Snyder’s film meant to be providing a revitalised, updated take on The Man of Steel? Do we really need to see the narrative hook’s of this new film blatantly plundered from a pair of highly-regarded predecessors over thirty years old? After all the flak that Bryan Singer’s film got for its overt dependence on the Donner films, the choice of Zod for Snyder’s does unavoidably send out the message that Man of Steel could conceivably be as much a re-tread of Superman II as Superman Returns was of the 1978 film. Besides, it’s not like Zod is the only viable big-hitter antagonist. While Superman’s Rogues Gallery was never as strong as Batman’s, he undoubtedly has a decent array of (cosmic) villains to face off against: Doomsday, Darkseid, the Cyborg-Superman, Mongul and, perhaps his signature alien nemesis, Brainiac. He could hit any one of them! It genuinely surprises me that Brainiac – who similarly has a direct connection to Superman’s alien origin via his abduction of the Kryptonian city of Kandor – didn’t emerge as Man of Steel’s main antagonist, not only because he has been very prominent of late in the Superman comics – particularly The New Krypton arc – but he’s never appeared on the big-screen. His time may yet come, of course. Then again, they could have taken a minor character and given them a dynamic big-screen reinvention, which is where Stamp’s Zod came from in the first place. Once again, I dutifully return to the seemingly-default position regarding any misgivings regarding Snyder’s film – “In Nolan We Trust”. The presence of Zod in Man of Steel is not a fatal excitement dampener by any means but it does, I think, highlight a disappointing dependence on prior history, as well as a lack of creative spark (both of which are indicative of a wider problem in Hollywood itself). It’s absurd to think that by 2013 when the Superman film franchise will be 35 years old, the six films will have essentialy utilised just two antagonists. I fervently believe – and I say this as a passionate fan of Superman: The Movie, which remains one of my all-time favourite films – that Donner’s efforts now absolutely need to be left to take their place in history, rather than being habitually leant on to provide gravitas or impetus. There’s no reason that a new Superman movie couldn’t equal or even better Donner’s seminal originals – but first you have to step out of that shadow.